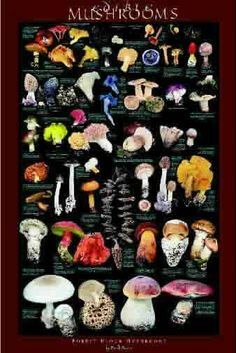 NOTE: Before reading this post which I hope you do, I would like to preface it by advising when working with mushrooms, consult with a practitioner who is knowledgeable and qualified to advise on how to use and maximize mushrooms to unleash their full healing power-recommending the best mushroom quality money can buy.. It is one thing to state mushrooms cure cancer and another to prove it. NOTE: Because there is a lot of” BS” out there, it is imperative to use only the absolute best gradient mushrooms available. Aside from being rich in valuable nutrients such as fiber, vitamins B and C, calcium, potassium, phosphorus, magnesium, selenium and zinc, mushrooms are also excellent sources of antioxidants, including some that are entirely unique to mushrooms. Ergothioneine and glutathione, both of which are found in mushrooms, are recognized as “master antioxidants” that inhibit oxidative stress. Both are considered important anti aging compounds. As noted in The Guardian, “… [Scientists think [ergothioneine and glutathione] may help to protect the body against the maladies of old age, such as cancer, coronary heart disease and Alzheimer’s disease.” Ergothioneine appears to have a very specific role in protecting your DNA from oxidative damage, while glutathione is important for successful detoxification of heavy metals and other contaminants. In the U.S., half of the nation’s mushroom crop come from Chester County, Pennsylvania, where indoor farms produce more than a million pounds of mushrooms per day. It’s important to eat only organically grown mushrooms, though, as they absorb and concentrate whatever they grow in, for better or worse. Mushrooms are known to concentrate heavy metals, as well as other air and water pollutants that can defeat their medicinal value. Alpha and beta glucan molecules are among the most important polysaccharides. Beta glucan in particular enhances immunity through a variety of mechanisms, many of which are similar to those of echinacea or astragalus root. For example, it binds to macrophages and other scavenger white blood cells, activating their anti-infection activities. The beta-glucan in mushrooms also plays a role in fat metabolism and may help support healthy cholesterol levels. Mushrooms also contain a number of other unique nutrients that many do not get enough of in their diet, including B vitamins like riboflavin, niacin and pantothenic acid, as well as copper, the latter of which is one of the few metallic elements accompanied by amino and fatty acids that are essential to human health. Since your body can’t synthesize copper, your diet must supply it regularly. Copper deficiency can be a factor in the development of coronary heart disease. Other bioactive and medicinal compounds include terpenoids, steroids, phenols, and all of the essential amino acids (they’re especially good sources of lysine and leucine). Cordyceps, also called Caterpillar fungus or Tochukasu, has been studied for its antitumor properties. This parasitic mushroom is unique because, in the wild, it grows out of an insect host instead of a plant host. It has long been used within both traditional Chinese and Tibetan medicine. In a Japanese animal study, mice suffering from sarcoma were given shiitake mushroom extract. Six of 10 mice had complete tumor regression, and with slightly higher concentrations all 10 mice showed complete tumor regression. Considering the scientific evidence, it’s easy to understand why mushrooms have been valued for their medicinal properties for centuries. In ancient Egypt, mushrooms were thought to bring long life, and today we know that this may be due to the many beneficial phytochemicals and other compounds they contain. • Weight management: One study found that substituting red meat with white button mushrooms can help enhance weight loss. Obese participants with a mean age of just over 48 years ate approximately 1 cup of mushrooms per day in place of meat. The control group ate a standard diet without mushrooms. At the end of the 12-month trial, the intervention group had lost an average of 3.6 percent of their starting weight, or about 7 pounds. They also showed improvements in body composition, such as reduced waist circumference, and ability to maintain their weight loss, compared to the control group. • Improved immune response to pathogens: A study done on mice found that white button mushrooms enhanced the adaptive immunity response to salmonella, a common food borne pathogen that can cause food poisoning. • Enhanced athletic performance and more: Cordyceps is a favorite of athletes because it increases ATP production, strength and endurance, and has anti-aging effects.Cordyceps also has hypoglycemic and possible antidepressant effects, protects your liver and kidneys, increases blood flow, and has been used to treat Hepatitis B. • Anti-inflammatory effects. Cordyceps are also recognized for their potent anti-inflammatory characteristics, which may be useful for conditions such as asthma, rheumatoid arthritis, renal failure and stroke damage. One of the active medicinal compounds in cordyceps responsible for many of these effects is cordycepin. With all the evidence supporting mushrooms’ medicinal superfood status, I highly recommend adding some to your diet. They’re an excellent addition to any salad and go great with all kinds of meat and fish. “Let food be thy medicine” is good advice indeed, and with mushrooms that is especially true, as they contain some of the most powerful natural medicines on the planet. Just make sure they’re organically grown, to avoid harmful contaminants that the mushroom absorbs and concentrates from soil, air and water. Also, avoid picking mushrooms in the wild unless you are absolutely sure you know what you’re picking. Shiitake (Lentinula edodes): Shiitake is a popular culinary mushroom used in dishes around the world. It contains a number of health-stimulating agents, including lentinan, which has antitumor properties and helps protect liver function,relieve stomach ailments (hyperacidity, gallstones, ulcers), and may lower your risk of anemia, ascites and pleural effusion. Shiitake mushrooms also demonstrate antiviral (including HIV, hepatitis and the “common cold”), antibacterial and antifungal effects; blood sugar stabilization; reduced platelet aggregation and reduced atherosclerosis. Reishi (Ganodermalucidum): Reishi is known as Lingzhi in China, or “spirit plant.” It’s also been given the rather telling nickname of “mushroom of immortality.” Reishi has been used medicinally in Asia for thousands of years. One of its more useful compounds is ganoderic acid (a triterpenoid), which is being used to treat lung cancer,33 leukemia and other cancers. 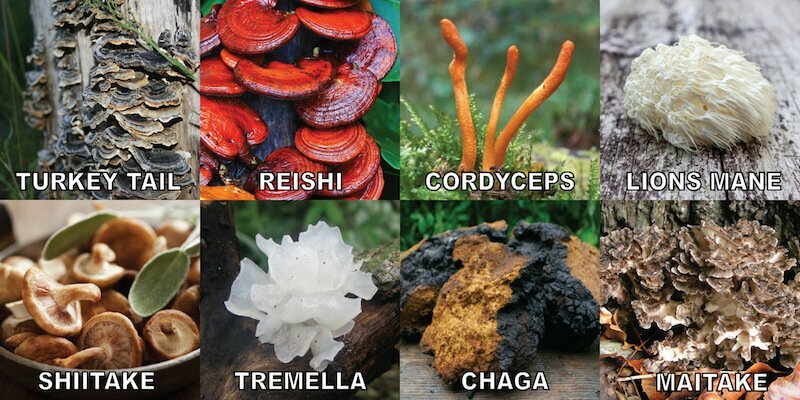 The list of Reishi’s health benefits includes:antibacterial, antiviral (herpes, Epstein-Barr) and antifungal (including Candida) properties; anti-inflammatory properties; immune system upregulation; normalization of blood pressure; reduction of prostate-related urinary symptoms in men. Turkey Tail (Trametes versicolor): Turkey Tail is also known as Coriolis versicolor, or “cloud mushroom.” Two polysaccharide complexes in Turkey Tail are getting a great deal of scientific attention, PSK (or “Kreskin”) and PSP, making it the most extensively researched of all medicinal mushrooms with large scale clinical trials. PSP has been shown to significantly enhance immune status in 70 to 97 percent of cancer patients.Turkey tail is also being used to treat many different infections, including aspergillus niger, Candida albicans, E. coli, HIV, herpes and streptococcus pneumonia. It’s also hepatoprotective and may be useful for chronic fatigue. Himematsutake (Agaricus blazei): Himematsutake, also called Royal Sun Agaricus, is a relative of the common button mushroom. Himematsutake mushroom is attracting worldwide scientific attention due to its remarkable anticancer properties related to six special polysaccharides. Like many other medicinal mushrooms, this fungus can also protect you from the damaging effects of radiation and chemotherapy. But its benefits don’t stop there. Himematsutake may also help decrease insulin resistance in diabetics, improve your hair and skin, and even treat polio. NOTE: For more information about the Miraculous Healing Potential of Mushrooms, contact me at drp@drprincetta.com or 619-231-1778.